Memory card data recovery software utility recovers and rescue lost deleted files from corrupted or defective memory card storage media. 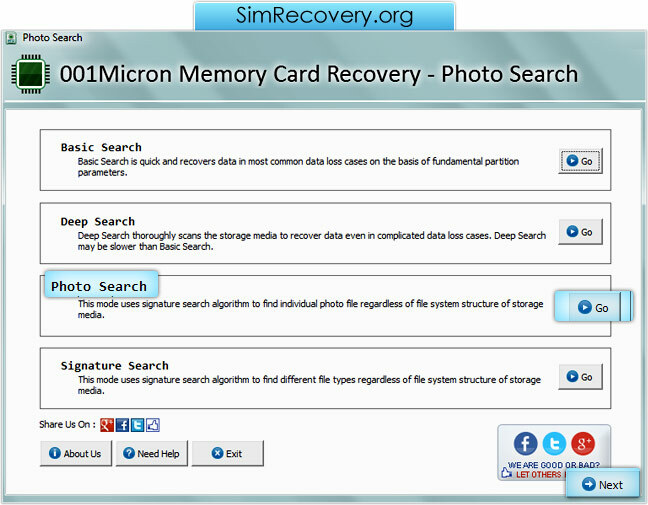 Data recovery tool retrieves data from multimedia memory card and flash memory of your digital camera, mobile phones, handheld computer, mp3 player, Pocket PC, PDA and other memory card supportive storage media. Files retrieval software restores any type of digital files and folders including riff, 3gp, mov, wav, midi, quick time, psd, cdr, xls, ppt etc stored in your digital media memory card device. Supported Media Devices - Compact flash (CF card), Picture card, micro drive, MMC, secure digital card (sd card), flash media, smart media, PSP Memory card, sD Gaming card, Mini-SD card, RS-MMC, Micro M2 memory card etc. Supported Brands of Memory Card - Fuji film, HP, Kodak, Casio, Olympus, Ricoh, Samsung, Sony, Toshiba, Panasonic, SanDisk, Kingston, Canon, Mitsubishi, Nikon, Pentax, Polaroid, PQI, Pretec, Ritek, Kingmax, Konica-Minolta, Kyocera, LG, Memorex etc. Supported File Formats - JPG, JPEG, PDF, MOV, TXT, MPEG, WMP, AVI, TIFF, TIF, DOC, BMP, GIF, PNG, MIDI etc. Supported Memory Card Size - 128MB, 256MB, 512MB, 1GB, 2GB, 4GB and even higher capacity drives. User Interface - Graphical user interfaces helps user to understand the functionality of the memory card files recovery software.